Its Christmas! Happy Christmas everyone! Today (well this should have gone up yesterday) i thought i would do a post all about my friends and family favourite thing about christmas. They have all written a paragraph for me on their favourite thing, from the food to the company. I asked my mum her favourite thing and her answer was simply "nothing". Such a bag-humbug! "This may sound very cliche, but my favourite thing about Christmas and general Christmas time is how it brings everyone together; Family, work colleagues, friends etc. Everyone is in a great spirit ad cheery (apart from when Christmas shopping, but we all know thats a nightmare lol). I also love watching people open the presents i got them. Watching someone open something and they have no idea what it is, but you know they will love it makes me so happy, watching them smile. And lastly, i also love the food. Roast dinner and a ton of chocolate,y yummmmmmmmmy yum yum!" - Holly, best friend. I hope you enjoyed this post and you have such a lovely christmas day. I haven't done a paragraph because everything i would have said has been done for me, but the lovely ladies who i asked to do this. Anyway, Happy Christmas and thanks for reading! I was supposed to post this yesterday, but I just didn't get a chance as I was very busy. I saw a picture of this cake on Pinterest whilst I was browning and I just had to make it. It's super Christmassy and festive and also so different and original. I didn't make it very well, but for my first try I am very pleased with it and I know now for next time, if there is a next time, what the do's and dont's are. 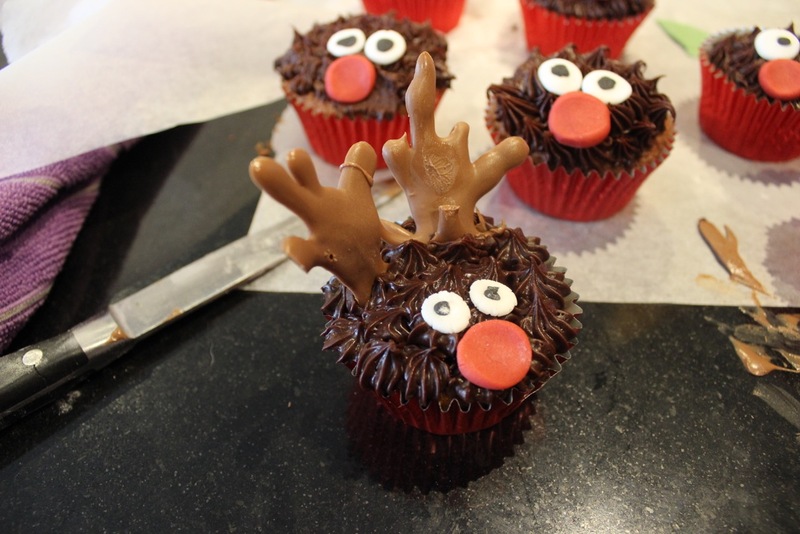 To make this you will simply just need to same ingredients as my reindeer cupcakes, just I just used 4 eggs instead of 2. It's the same concept, so you weigh the eggs and then this is the weight of all the other ingredients. It took longer to cook then I thought it would, but there's plenty to do in this time. The icing is optional. You can pre buy or make this depending on your laziness. My sister did the icing and it's really simple and self explanatory, so I won't tell you to cut out a squiggly circle and some holly leaves. I'm sure you are all more then capable of this. Once the cake has finally cooled, you just make it more rounded and eat the off cuts of course. Then you can add a filling to the middle of you want too. I wish I did this but I forgot. 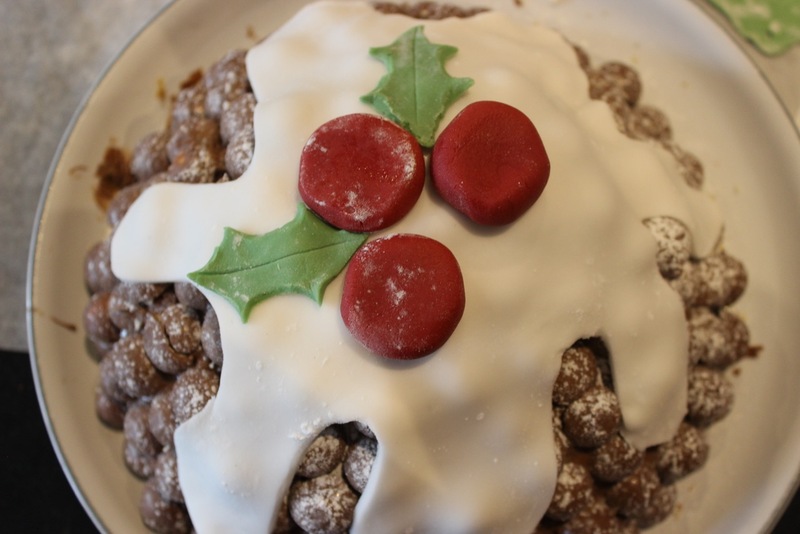 Simply smother in frosting or chocolate and stick the maltesers. We ended up chopping our maltesers in half as we didn't buy enough. Once you have done this you have completed the cake. You can now tuck in and enjoy! I hope you enjoyed this post and like the cake if you make it. I really enjoyed making it and getting my creative flare out. Thank you for reading and happy Christmas Eve! Its so close to the end of my 12 days of christmas blog series. I can't believe how quickly this year has gone and how un-christmassy it feels in the UK for me. I am not excited about getting out of the country for a week for New Years. 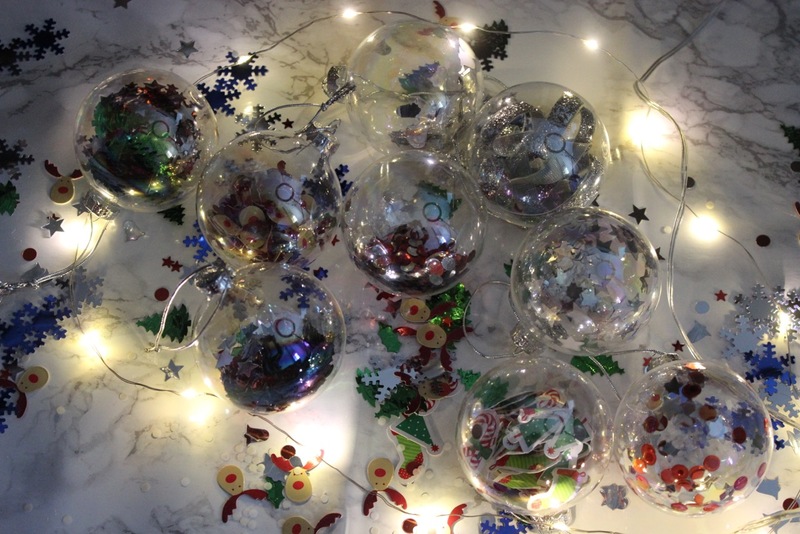 Today i thought i would show you my DIY Baubles which i made back in mid December. Doing this blog series has made me unleash my creative side which has been hidden for the past 18 months. I just bought some glass baubles from ebay along with glitter, confetti, ribbon and so many more decorative items to fill the baubles. I am so happy with them and although some of them look like a 3 year old has attached them, i just love the messiness and crazy side to them. These are so easy to make and you can add whatever decorations you like to them, it completely up to you. Of course you can have a colour scheme and decorate them differently with certain colours. You can also personalise them and we have a personalised one from my cousins wedding, which is so cute and makes for a lovely memory on the tree. One thing i have loved about this blogpost is that I've pushed my boundaries and done DIY and baking. I never normally do these and i just think they are really fun and festive. I hope you enjoyed this post and thank you so much for reading! 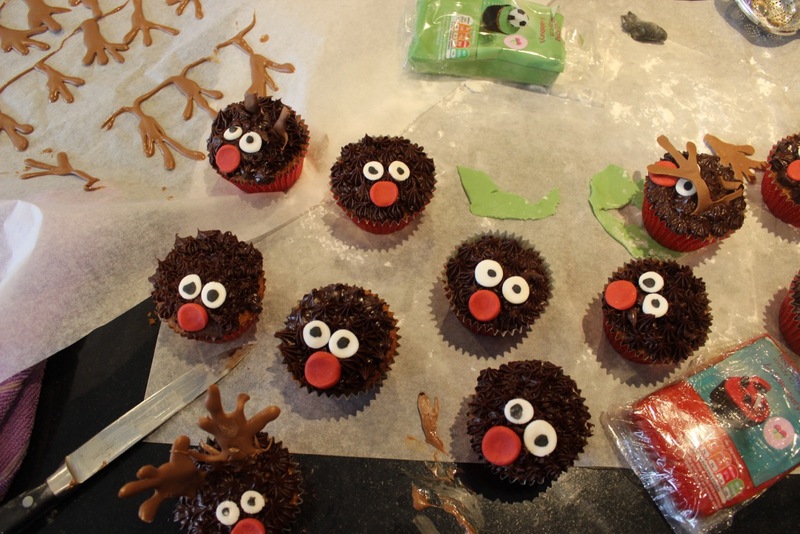 Today, i thought as the end is in sight of my 12 days of Christmas that i would do a kinda of failed attempt at making Rudolf Cupcakes. Firstly, how do you spell rudolph? Is it ph or just an f? I have no idea so there may be a variety of the both options in this post. I saw this idea on Pinterest in a form of a cake. As i was already planning on making a cake (blogpost Weds) then i thought, why not make them into cupcake. Cupcakes are so easy. All you need is 2 eggs and then you just weigh the eggs (i know, its sounds weird, my cousin taught me this, but trust me it works) and then the weight of the eggs equals the weight of the sugar, flour and butter. Of course, a dash of milk and smidge of vanilla essence and baking powder is optional. I tend to use them as i find the mixture can start looking a bit dry, so thats when i tend to add the milk. Then you cook them for around 15-20 minutes, depending on your oven and the temperate, which should be around 180-200 degrees celsius. The frosting and decoration was the hardest. The chocolate is just a Devils Food Mix one, the chocolate fudge one i believe. I then just put this into a piping bag with a nozzle and voila, you have star icing. 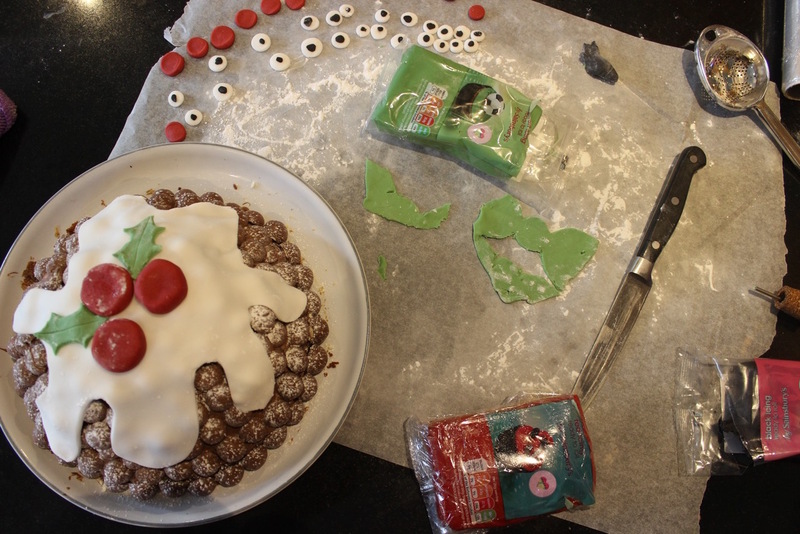 The royal icing, is pre-made, because I'm lazy and i just made very un-even eyes and a red nose and you have your Rudolph. The ears were a little tricky. I bought Cadburys and i watched a video on tempering chocolate ages ago and i think it said that if it contains veggie oil, you don't need to temper it. Anyway, i just bunged it in the microwave and melted it then attempted to make some ear shapes and popped these in the freezer. Then it just went downhill from there. They melted as soon as we touched them to try and stick them into the cupcakes. I managed to get one that looks some what decent, but as you can see, it just didn't work. They also weren't completely set and our house is like an oven, so they just melted as soon as i took them out of the freezer. Anyway, there were so much fun to make and they still taste really nice, which is always a good thing. I love baking festive goodies, i feel like its so much fun and you can make really cute fun goodies as well. Thank you so much for reading and i hope you enjoyed! Another day and another blog post in my 12 days of christmas series. Apologies this is a day late, busy would be an understatement for this weekend. I was hoping for a chilled weekend, but turns out, that wasn't allowed. In todays blogpost, i thought i would do a last minute blogpost. I am the type of person to buy all of my presents on Christmas Eve, purely because i have no idea what to buy my family and i hate going into town to be surrounded by thousands of other people in a rush. my sister is awesome. I have done a majority of mine online this year and i only have my mums and brothers to get. I have left the hardest two until last which is not surprising. 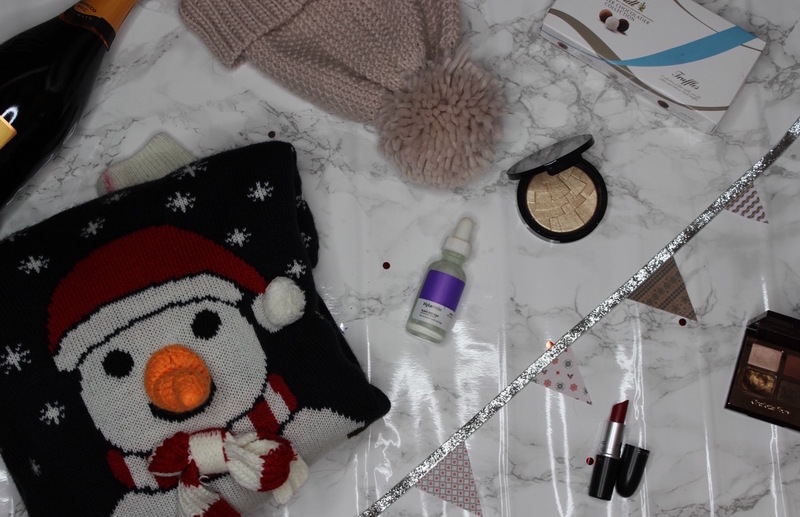 Firstly, i have selected a few items which are easy to pick up for last minutes gifts, this ranges from skincare, makeup, food, perfume, homeware, photography and candles. All of which i think are very quick and easy to buy for someone. I know i would be happy to receive any of this, so i am sure others would. Alternatively, if you are on a budget, you could easily make a cute little gift from any bits and bobs lying around the house. It doesn't have to be super extravagant, sometimes, its the smallest items and the ones with the most thought in that mean the most. Personalised gifts are always great too. I got this personalised Marmite Jar from Secret Santa at work and i have no words at how much this had made my year. I love marmite and to have a jar with my name on, just makes it so much more better. Last minute findings don't have to be expensive. A little candle, a photo frame with picture in, a piece of small jewellery, a homeware item, makeup, perfume, body care, skin care the list could go on and on. I hope you have enjoyed reading. I didn't want to go into detail on every product as this isn't a review of them, its just to put some ideas out there. Thank you for reading! A quick note to say, i apologise for not putting this post up on Friday. I was super busy and didn't have time in the evening to take pictures and then upload them onto my laptop. I could have done it when i got home, but that was around midnight and i was tired, so i went to sleep instead. As you know the 18th December was Christmas Jumper day. 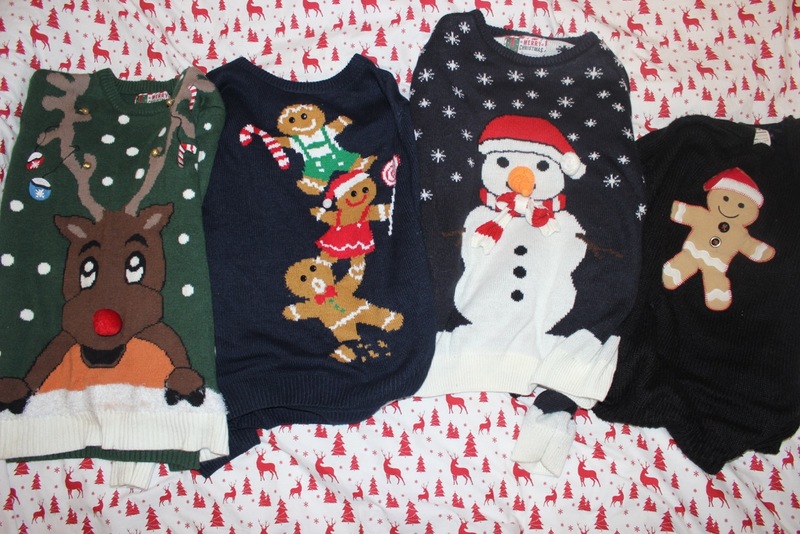 I love Christmas Jumper day and decided to of course, write a blogpost about my christmas jumpers. I only have 2, but my sister also has 2, so i will show them all to you. Over the last year or so, Christmas Jumpers have become a staple around this time of year. They are very festive and also you can get such a good variety of them. I mean, now they even come with flashing lights and songs. I like the more simpler christmas jumpers and my favourite one, has to be my gingerbread man one. Its super comfy and has just the right amount of festiveness in it. I do also own a snowman one, which i wear to a friends christmas jumper party, but asides from that, its just too thick for me and also the carrot nose annoys me. My sisters christmas jumpers are also pretty similar. She has a gingerbread man one with 3 gingerbread men and women on which is simple, cute and festive. She also has a reindeer one from Primark which is 3D, so pretty similar to my snowman one, which was also from Primark. I think she's worn this once, which was last year. I love how they now have a dedicated day to help charities as i think thats such a good way for everyone to be festive and raise money for amazing charities at the same time. I would love to get some more christmas jumpers next year. I normally start wearing them around August time, when i realise i have no jumpers, such i just pull these out and only wear them around the house. I hope you enjoyed this post. I would love to see your festive christmas jumpers. Thank you so much for reading! 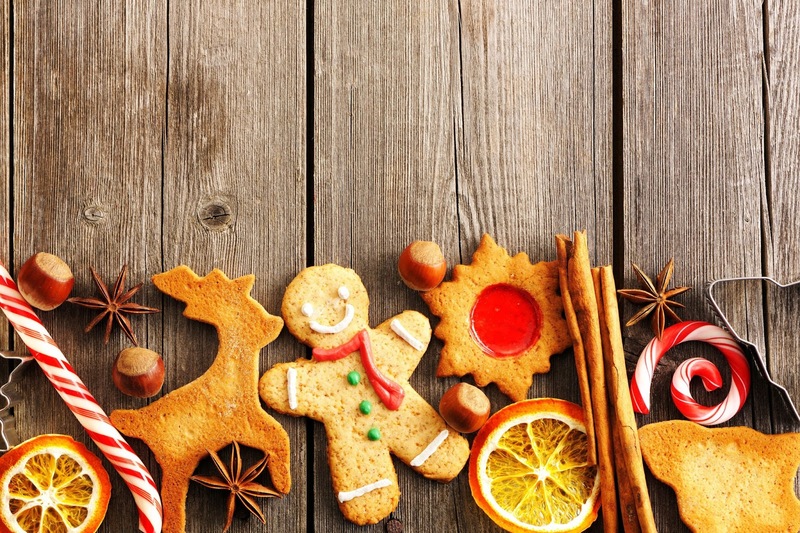 Its day 6 of 12 days of christmas and today i thought i would share this amazing christmas baking idea i saw on Pinterest. I have been loving Pinterest to get inspired for my christmas blogposts and i forgot how amazing it is. I have come across so many baking ideas, that it was hard to choose which ones to blog about. In the end i narrowed it down to 3. Baking is something i really enjoy, but i very rarely do it, because i have the cleaning up process. To make this process easier, i decided to be a bit of a cheat and buy some cookies. I decided to go for white chocolate chop cookies from Sainsburys. They are delicious and i would highly recommend. 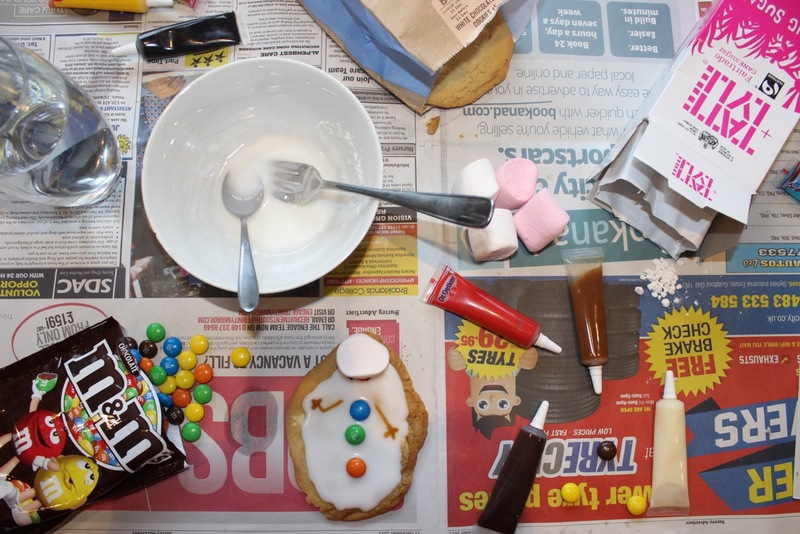 Its a very simple task of just coating the cookies in icing and then placing down the marshmallow, which acts as the head, so you can place this wherever you choose. Next i drew on the face, this was the hardest part as i have very shaky hands when it comes to do small details and you can also draw the twig hands on at this stage. The final stage is to place the buttons onto the snowman body. So there we have it, another super easy recipe to make some festive snowman cookies, or at least decorate some pre-made cookies. I hope you enjoyed this post and thank you so much for reading! Its another day (I've actually forgotten how many days into this i am) of 12 days of Christmas and today i thought it would be fun to do a christmas tag post. I love watching tags as i feel you get to know someone better and their thoughts etc. I have scoured the interest for the tag i like the most and i have come across the questions below, which i am excited to answer for you guys. This is pretty easy. Elf. An amazing classic christmas film. I really want to see this musical of this, i don't have high hopes but i just think it would be fun to see. 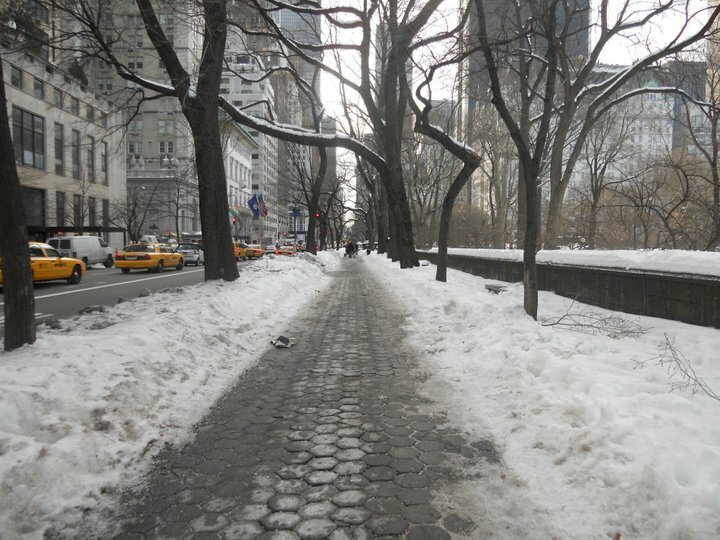 I do also love the Holiday, but thats partly because it was filmed in my hometown. As kids, we used to open our presents in the morning, but as we have got older, we normally do it around mid-day, before we have our christmas lunch. I don't really think i do. I can remember as a child, our grandad would hide presents around his garden for everyone and that used to be really fun to do. As we have grown older though, for me, its just about spending time with family. Pigs in blankets. Need i say more. There is so many to choose from, but i can't remember them all. My favourite to date would be my Mulberry purse which i got last year. I love cinnamon scents around this time of year. I know alot of people like christmas tree scents, but i actually don't know what a christmas tree smells like, so i can't join that fan club. Nope, its just another day to us. Or for my Dad and I the day to get all of your presents which you have failed to get. This year, we have a copper star, which is beautiful. I wouldn't say this was wild, but i never got a baby Annabel. When everyone else had them in the 90's i think i was the only person not to receive one. I also wanted shop till, as i loved the idea of scanning items and secretly i still want a toy one, but high tech now of course. For me, this is easy. I love spending time with family and giving others gifts. I love when everyone is together, not worrying about anything, crying from laughing too much, stuffing your face with too much food and just relaxing and having fun with family. So there we go, my christmas tag. I decided to go for red font, to add some extra festiveness.I hope you enjoyed and i would love to know your answers to the questions above. I hope you have had a lovely day and thank you so much for reading! 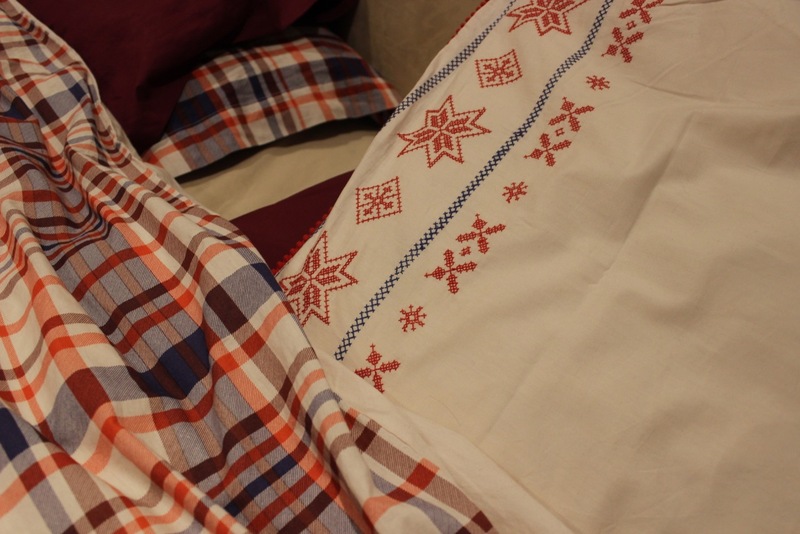 Its day 4 of 12 days of Christmas and today i thought i would write about Christmas bedding. Over the past 2 years, Christmas bedding has turned into a must have item for most people. Before this year, i had never owned any christmas bedding and that just wasn't okay. Lots of different retailers stock christmas bedding and there is so much to choose from. We decided to get ours from Marks & Spencers this year and I'm so pleased with them. Mine came in a multi-pack with my sister and my parents got a double sided one for their bed. I think they are all super festive, especially my sisters, which is the one i want. I love that you can still get double-sided bed linen and the one my parents have from Marks & Spencers is really cute and subtly festive. I have a seen a variety of christmas bedding which i really like from Asda, Primark, Yorkshire Linen Co and so many more places. Next year, i really want to pick up some more super festive ones. 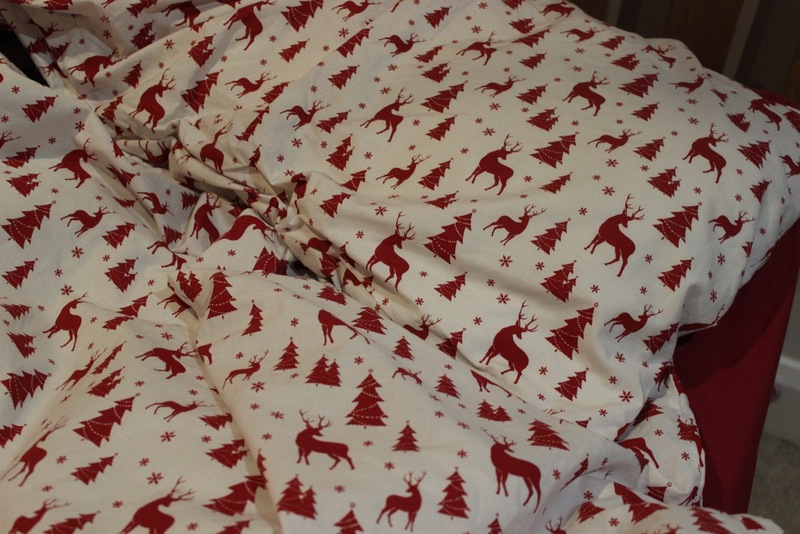 Theres nothing better then getting into bed and knowing that you can feel all festive with christmas bedsheets. I hope you enjoyed this christmas bedding post. I love anything to do my bedroom, so this post just seemed blog about and especially at christmas with christmas bedding. Thank you so much for reading! Its Day 3 of 12 days of Christmas and today i thought i would talk to you about my christmas favourites. I don't have many and i actually found this harder then i thought i would, but nevertheless, i have picked out a few festive items which i enjoy around this time of year. First up has got to be a good Christmas Jumper. Everyone must have a christmas jumper and if you don't, then you either hate christmas or have been living on planet X for the last couple of years. 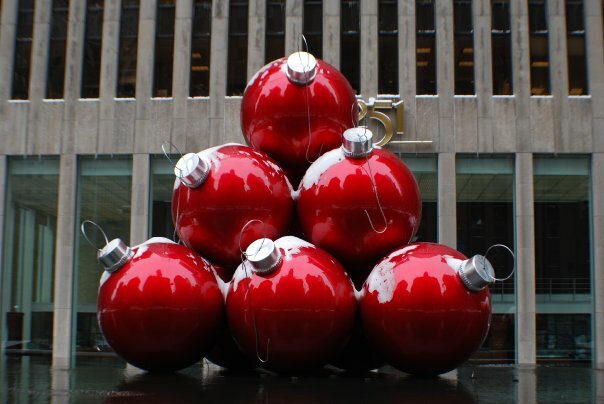 I am not a big fan of christmas, but its still a necessity to have one or two. I have a snowman one from Primark and also a really cute gingerbread man one from New Look. Not going to get into too much detail as i may or may not have a blog post coming up on them. Next up is really odd and something i should be into all yer round, but i really love doing skincare in the winter months. I think its because i can feel the effect the cold weather has on my skin and i absolutely hate it. I love nothing better then coming home and lathering my face in serum and moisturiser. Its not really a christmassy thing, but it certainly does love the winter months. Next up has got to be champagne and chocolate. You can never have enough of these. I don't really drink any form of alcohol, but if i do, i do love a good champagne. My expensive taste isn't pleasant for my bank balance, but i can stretch to prosecco if i have too. I rarely drink champagne after drinking 4 bottles last new years eve, but i do like to have a glass or 2 on christmas day to celebrate. Chocolates are an all year thing, but the maltesers celebrations are just divine. Someone tell me why they haven't made a tin just for them?!?! Christmas films and music are just an absolute must. From the classics to the new films (not the christmas bunny, looks horrific) they can really get you in the mood for the festive season and when people hear them, i feel everyone is so much more happier and joyful and festive. Sunday nights are the perfect time to wrap up and watch a good christmas film, whether its the Grinch, Elf, Holiday, Home Alone, you can not beat a christmas film. Wooly hats are just my favourite accessory at christmas. I never wear them in the winter and i think they are so festive and just so cute. 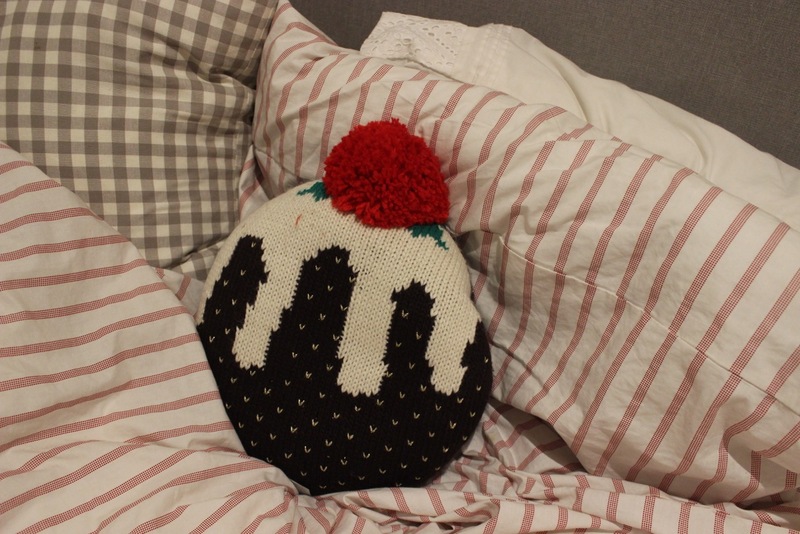 I have seen lots of people with christmas pudding ones and i really want one, but i just haven't managed to find one. I think they are just the ultimate christmas accessory and they really do make a christmassy outfit even more festive and winter appropriate. Finally is some Red lippie and glitter. I love this combination at Christmas as its so festive and really suits the christmassy vibe. I love have golden glitter eye makeup and also glory highlighted cheeks. For me, they really make me feel so much more festive and glam for the christmas period. There is nothing better then red lips on Christmas day either! So there we go, my christmas favourites. I don't have many, but what i do have i really love to pieces and are super special to me. I would love to know your christmas favourites. I hope you enjoyed and thank you for reading! 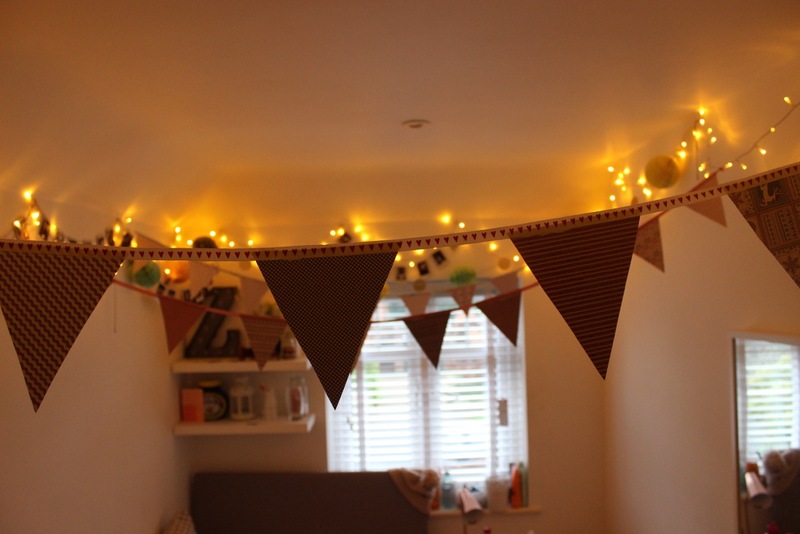 Its day 2 of 12 Days of Christmas and today i thought i would try out some DIY Bunting which is super cute and festive. 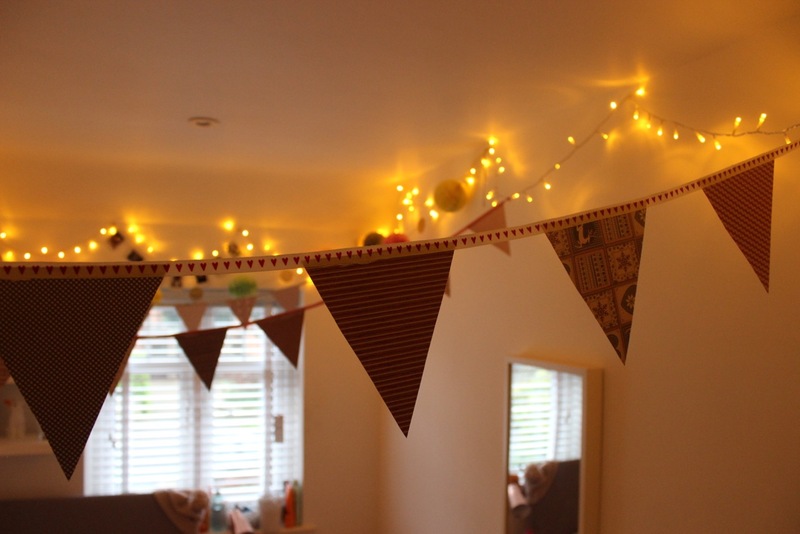 I have always loved the idea of making bunting but I've never managed to actually make it. What better time then Christmas? It was really easy and you need minimal materials and most of which you would have lying around your house, bedroom or anywhere you are. I am super pleased with how they have come out and they make my bedroom so much more christmassy when i walk into the room. Its quite simple to make. 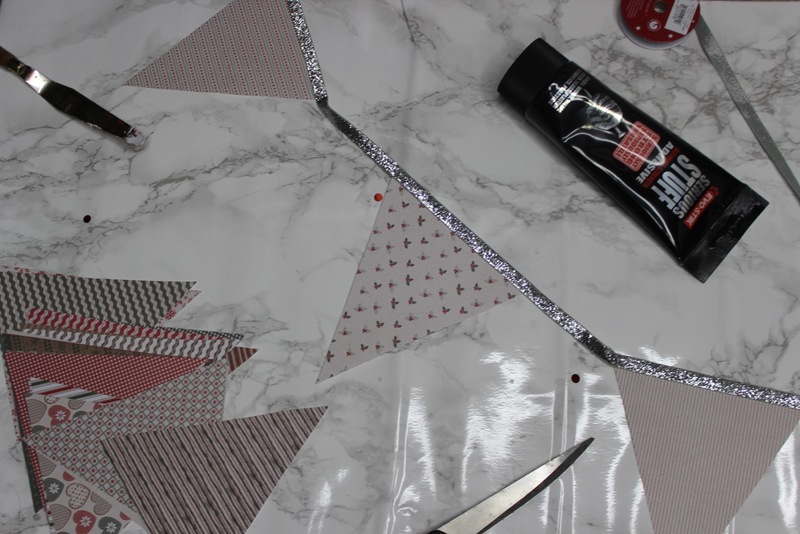 Just cut your paper into triangle to your shape and size preference, then depending on whereabouts you want to place the bunting, measure the amount of ribbon you will need. Next cut all of your triangles out of the paper and then if you want, put them in some form of order or you can just leave them as they are and freestyle how they sit next to each other. Then its simply, stick them to the ribbon, wait for them to dry and then place the bunting where you want it to go. 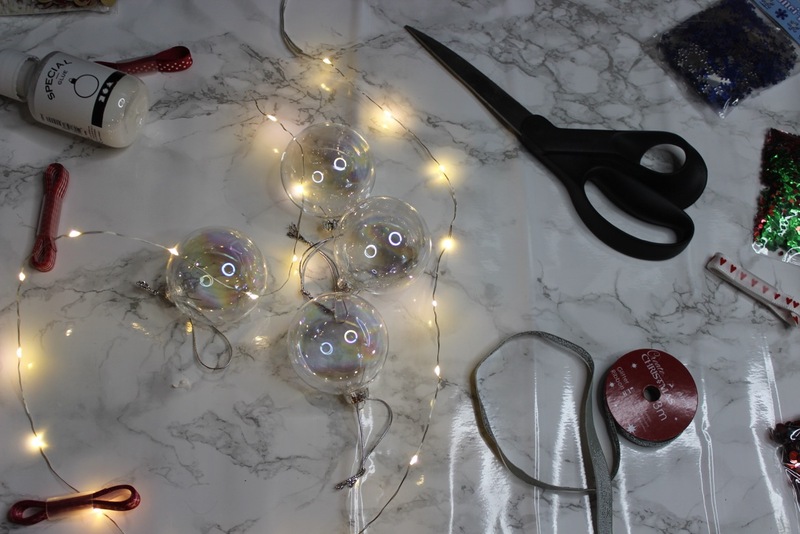 Its a really easy and quick DIY to do and instantly makes any room feel so much more festive and just add thats little bit extra to the room. Whenever i walk into my room now, i feel so cosy and christmassy and it is also really nice to look at when you walk in. Of course, you don't just have to do this for christmas, you can do it with any materials for any occasion or just to make any room that little bit more cute and homely. I hope you enjoyed this post and if you make your own bunting, please do let me know, as i would love to see your designs and ideas and placement. Thank you so much for reading! Welcome to my 12 days of Christmas series. I am so excited to do this, as i have been watching vlogmas and thought that i could kind of incorporate it into my blog. So as you may have guessed i am doing blogmas, but as I'm called it simply "12 Days of Christmas". 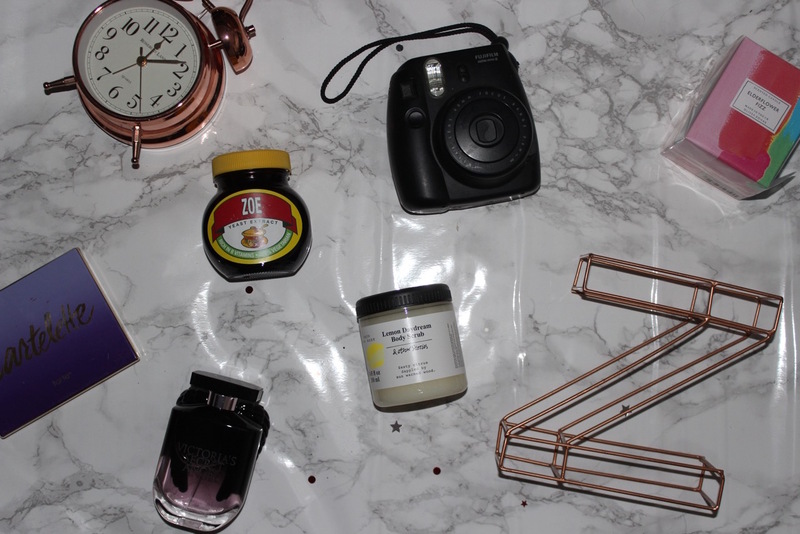 I am going to have a new blogpost every day ranging from baking, gift ideas, diy, home decor and so much more. I am super excited to share this with everyone and i hope everyone enjoys it, as much as i am. First up, i thought we would start with something super easy and cute. As you may have guessed from the title and the picture, i have scoured around Pinterest and found these supercuts marshmallow reindeers. There are the cutest and the most easiest things to make and they just look adorable, so lets get started. 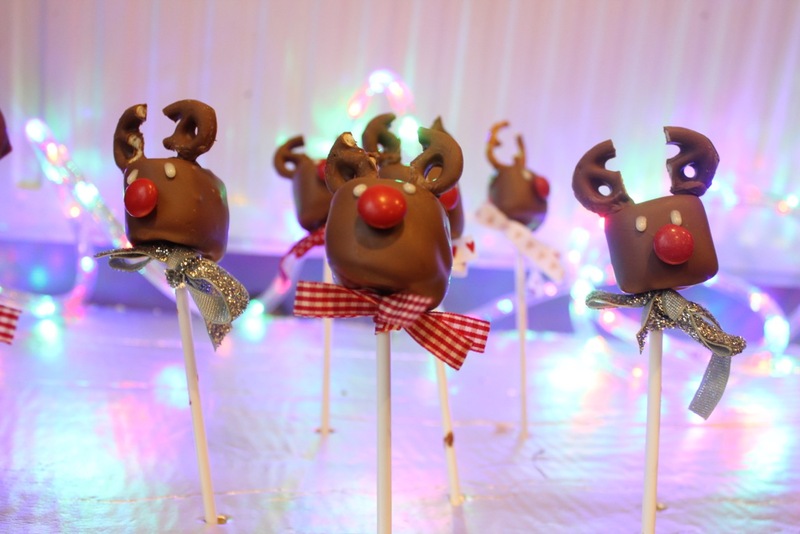 You will simply just need chocolate to melt, marshmallows, cake pop sticks, pretzels, white icing and a form of red sweet for the nose, i used M&M's. Its a pretty self explanatory task and the hardest bit was actually putting the ribbons on at the end, but that is optional. All you need to do is melt the chocolate, dip the marshmallow, wait for them to set, add the pretzel and nose and eyes and voila. Your done. I decided to use the cadburys pretzels, but i did do one with normal pretzels (as you ca see in the background), but i wasn't to keen on the taste of them. These are super fun, super cute, super yummy and super festive. I am on to a christmas jumper party this evening and i am so excited to take these along and let everyone choose their favourite one. Everyone who has seen them has been very impressed and they are are really effective and don't take up much time at all. I hope you all enjoyed and i hope you liked day 1. Stick around for tomorrow, when things will be getting sticky and your bedroom or any room can have a touch of christmas added to it. I hope you enjoyed this post and thank you so much for reading!